Designed with beauty and purpose, the unique shape of the Ultimate Culinaire is characterized by rounded sloping sides that flare out as you reach the top of the pan’s large diameter. This along with the corner-free interior allows whisks and spatulas to reach the entire surface of the pan, making it ideal for preparing sauces and custards, which require frequent stirring. The 3 Qt. capacity gives you the versatility to use this pan for cooking oatmeal, risotto, and polenta, for making a delicious chocolate molten cake, or even creating a beautiful Jell-O dessert. It is also accompanied by a distinct spoon that offers a front pouring spout to help you drizzle and garnish any meal with precision. Together, you can do it all! As the host, you supply the kitchen and a few friends who have a healthy appetite for learning, good food, and, of course, fun. 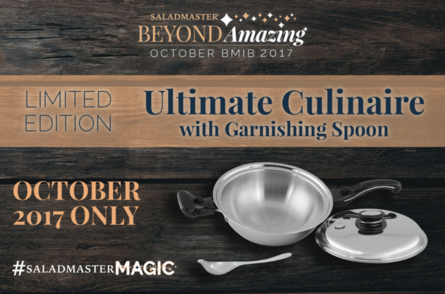 We'll demonstrate just what makes the Saladmaster cooking system so unique by cooking an unforgettable meal. Everyone is invited into the kitchen. While we cook, you and your guests can sample and learn and we'll cook a meal guaranteed to be the highlight of everyone's day. If you like the idea of having pie for dinner and dessert, then you're in for a real treat! Watch this Facebook Live cooking demo to see four oven free Saladmaster stovetop recipes! Try Spaghetti Pie or Lebanese Spiced Meatballs for dinner, and then enjoy a piece of Coconut Lime pie for dessert. Oh, and did we mention you can also have Watermelon Pizza? Yes! This video and the recipes tell all!